Clean ... Quiet ... Neighborhood and Campsite friendly. No noise. No fumes. Just loads of fun. The MotoTec 500 watt dirt bike sports many features found on a full size dirt bike. All steel frame. Real off road style tires. Strong, BMX style handlebars. Real off road suspension comes standard. 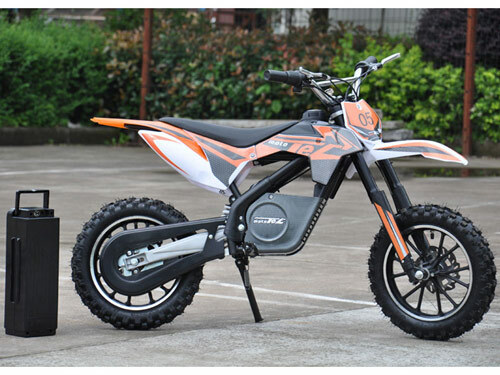 This child friendly electric dirt bike performs equally well on hard surface roads or zipping up dirt trails. Dependable MotoTec quality. An impressive gift for the child in your life. MotoTec 24v 500 watt offers many safety options as standard features. An electronic brake power interrupt system cuts power to the motor when the rear brake lever is squeezed. An invaluable safety option for new riders or any quick stop situation. 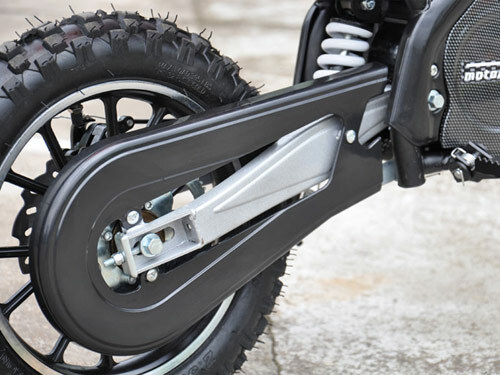 Unlike so many of our competitors today that are selling bikes with only one rear brake the MotoTec 24v Dirt Bike gives your child superior stopping power with Front and Rear Disc brakes. Chain and drive sprockets protection. Two point handlebar attachment. Cleated Foot pegs help prevent your child's feet from slipping. 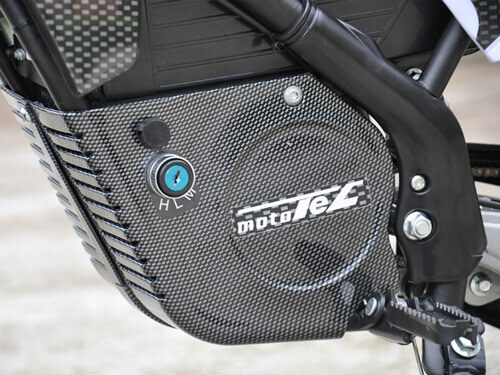 Sitting atop the stylish, decorative gas tank of the MotoTec 24v battery power dirt bike is the "fuel indicator". On board computer/controller analyzes battery status in real time and displays current battery charge level in this high visibility LED monitor. 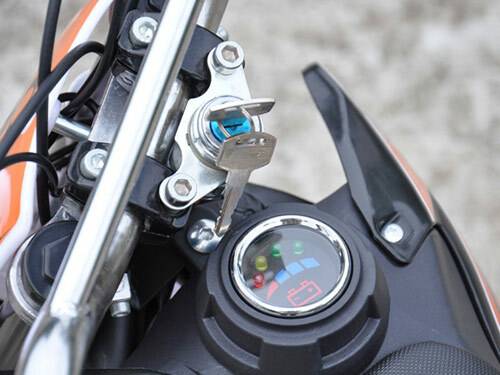 MotoTec Dirt Bikes "keyed" ignition helps prevent unauthorized use. Handlebars can be loosened and rotated forward or backward to meet your childes personal comfort requirements. There's More! 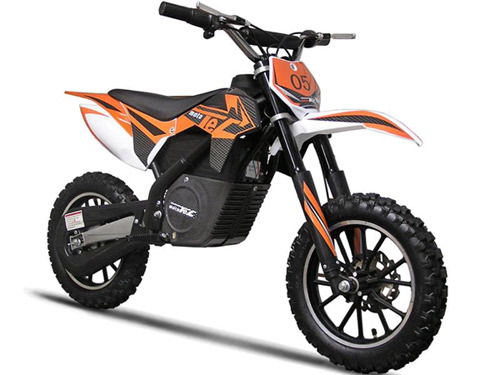 The MotoTec 24v dirt bike lets you control the power level available to your child. Simply insert the key, turn it to the desired power level setting and remove the key. Low setting will limit top speed to 5 mph. Good for younger, "just learning" riders and limited space practice. Medium power setting limits top speed to 10 mph. Good for neighborhood cruising, riding through the park or any less demanding situation. Saves battery charge for longer ride time. High power setting releases the full performance of the Mototec 24v dirt bike. The rider can take full advantage of the 500 watt motors capabilities. Top speed 16 mph. Fully active, long travel, front and rear off road suspension can handle most riding surfaces with ease. Mono shock, swing arm rear suspension, just like the "big bikes". Longer trailing arms help put the power to the ground with more authority. Nine inch ground clearance. Chain and drive sprocket cover help deflect rocks, sticks, tall grass, weeds and other debris clear of the drive system. Easy access to chain adjustment. Pneumatic tires have Knobby tread design for enhances off road capabilities. These robust tires absorb shocks and road hazards better. Stylish multi spoke cast aluminum alloy wheels are super light and super strong. Power pack removes easily from the MotoTec 24v. and can be charged separate from the scooter. Two higher capacity SLA 12 volt 12 amp hour batteries power the 24 volt electric system. These 12 amp hour batteries store 20% more power than the most commonly used 10 amp hour batteries. It all adds up to longer ride time and more fun for your child. Will My Child Fit This Product? Recommended Minimum Rider Age for the MotoTec 24v Dirt Bike is 12 years. 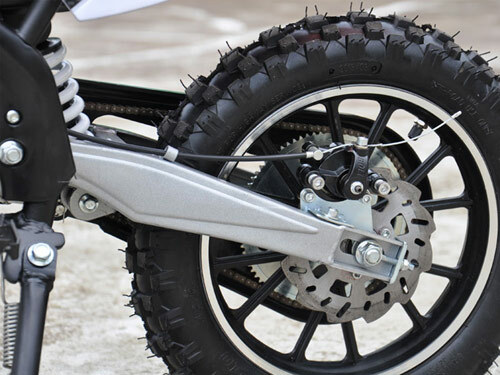 Recommended Maximum Rider Weight for the MotoTec 24v Dirt Bike is 150 pounds. Assembled Size is 49 inches long. Front of front tire to rear of rear tire. 32 inches high. Ground to handlebars. Seat Hight of 23 inches from ground. Operator should be able to straddle this scooter with both feet firmly on the ground. MotoTec 24v Electric Dirt Bike makes a memorable gift for any occasion. Product decoration subject to change without notice. 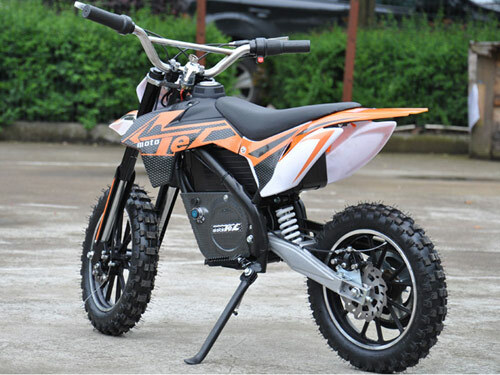 Click the button below to add the MotoTec 24v Electric Dirt Bike to your wish list.